Onion benefits the health by lowering blood sugar levels, reducing blood pressure, controlling diabetes, inhibiting stomach cancer, fighting infections, blood thinning, curing headache, healing upset stomach, etc. The bulbs, shoots, seeds and flowers of this biennial plant are usually used for medicinal purposes. Besides, onions have several culinary uses as well. In terms of variety, onions can be yellow, red, white or green. Each variety has a slightly different flavor. When sliced or chopped, onion causes eye irritation and tearing because while cutting onion into pieces, you crush its cells containing amino acids and their derivatives which, in turn, contain sulpur compounds. Its enzymes act on these compounds to produce sulfenic acids which further break down into a volatile compound that gets into the eye in its gaseous form and causes tearing. Onion is indigenous to South West Asia. It is produced in China, India, USA, Pakistan, Turkey, Russian Federation, Egypt, Brazil, etc. Like garlic, onion also belongs to the Liliaceae family. Onion has anti-inflammatory, antibacterial, antiviral, antifungal, antiseptic, anthelmintic, carminative, aphrodisiac, stimulant, anti tumor, diuretic and expectorant properties. This therapeutic herb prevents hardening of arteries, thereby preventing atherosclerosis and certain other cardiovascular diseases. It has anticoagulant qualities, too, that help slow down blood clotting. It has a flavonoid known as quercetin which is responsible for the anti-tumor benefits of onion (red and yellow). It is rich in antioxidants and thus, helps prevent stomach and colon cancer. Moreover, the herb contains chromium that helps control blood glucose levels. Onions help lower blood pressure as well. In addition, it wards off osteoporosis as regular consumption of onion prevents loss of bone minerals. Because of its anti-inflammatory quality, the herb is valuable when dealing with rheumatoid arthritis. Plus, it helps cure skin infections like boils and pustules. When mixed with honey, it aids in the natural treatment of acne. Other onion benefits include facilitation in the treatment of chronic bronchitis, cough, cold, fever, hyperglycemia, digestive distress, gallbladder disorders, diabetes, asthma, baldness, anemia, and so on. Furthermore, it is useful for asthma and helps increase appetite. 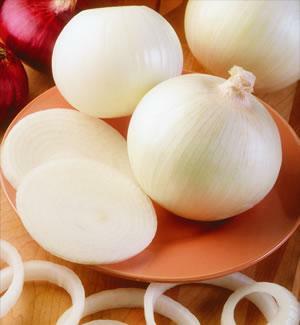 Besides, chewing raw onion kills germs in the mouth and relieves mild toothache caused by tooth decay. Here’s a video giving information on onion health benefits. In terms of nutrition, onion contains vitamin C, vitamin B6, folate, calcium, potassium, magnesium, phosphorus and manganese. It is low in cholesterol and saturated fats. Moreover, onion is a good source of fiber and flavonoids. It helps in the detoxification of the body and boosts immunity, too. On the whole, the healing properties of onion are similar to that of garlic, to a lesser extent, though. • Having half an onion (raw) per day is beneficial in controlling cholesterol levels. 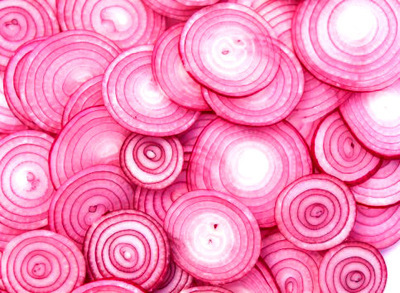 Eating raw onions prevents heat strokes, too. • Applying a mixture of warm sesame oil/mustard oil and onion juice benefits individuals suffering from arthritis. • Putting a piece of roasted onion on the affected area for 3-4 hours helps heal boils naturally. Rubbing onion slices on skin reduces warts. • Heat some olive oil and cook an onion in it. Place this onion on a pustule. It helps discharge pus and cures the infection. • Applying crushed onion on the forehead and temples reduces headache. • Unconsciousness caused by hysteria can be treated by inhaling freshly crushed onion. 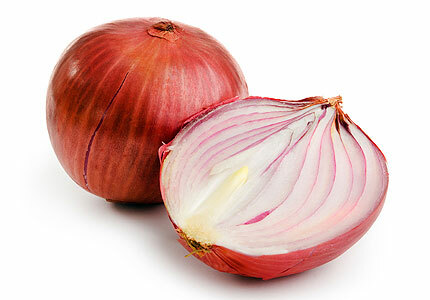 Moreover, it is a popular natural remedy for nosebleeds because onion acts as a natural coagulant. • Prior to bedtime, smelling diced onions kept in a jar, is an unusual yet effective natural cure for getting rid of insomnia and inducing sleep. • Having a mixture of one teaspoon of onion juice and an equal amount of honey helps you get rid of stomach ache and indigestion. • Taking one teaspoon of dried and powdered onion seeds, three times in a day is useful in curing sexual debility. White onion benefits in dealing with this problem. • Consuming a solution of 10ml onion juice and a teaspoon of sugar or powdered jaggery, two times in a day serves as a great onion home remedy for piles. You can also have onion slices fried in clarified butter. • Dilute onion juice by adding sufficient rose water in it. Use this solution as an eye drop to improve eyesight. • Putting two to three drops of onion juice (warm) in ears reduces earache and stop ringing in ears. Alternatively, you can use a cotton ball soaked in onion juice. • Prepare an onion decoction by boiling six grams of diced onion in half a liter of water until the quantity of water reduces to half. Strain and cool the mixture. Taking this home medicine serves as a valuable therapy to stop burning sensation during urination. • Add one teaspoon each of honey and onion juice. Keep it aside for about 4-5 hours. Finally, consume three to four teaspoons of this mixture two times in a day to relieve cold and congestion. Having onion tea several times in a day is useful in curing flu. • Mix one tablespoon of honey and 1/8 tablespoon of black pepper in a quarter cup of onion juice. Consuming this solution works as an effective natural treatment for asthma. You can add ginger juice as well. • For deriving benefits of onion in case of diabetes, boil a large onion in milk until it becomes soft and then eat the onion. Follow this procedure two times in a month, preferably towards the beginning and end of the month. • Applying onion juice on bald patches two times in a week helps cure the problem of hair loss. Follow this therapy for at least a couple of months. Onions with smaller bulbs are likely to have a sweeter taste. Hence, they are good for salads or on top of sandwiches. Furthermore, onions repel insects. If you are bothered about onion breath, you can have a glass of lemonade or a cup of green tea after eating raw onion. As working with onions causes tearing in eyes, you can chop onions under running water in order to dissolve the gas before it reaches your eyes. Another tip is to cut onions after freezing them for a while. You can also wear a pair of safety glasses to avoid eye irritation and chop onions in a well ventilated area. Plus, use a sharp knife. Before peeling and slicing, immerse the onions in a bowl of water to keep them wet. There are no particular side effects of this herb. Nevertheless, it should not be taken in excess, especially during pregnancy and breastfeeding. When taking onions along with anticoagulant or antiplatelet drugs, it may increase the chances of bruising or bleeding due to slow clotting. Besides, if you are suffering from heartburn, do not consume this herb too much. In addition, it may give rise to flatulence and coughing. Although it is rare still, possibility of allergy to onion also cannot be ruled out. However, on the whole, onion benefits outweigh the health risks associated with this herb. It is toxic for like cats and dogs, though.